HASA irregularly updates with our members the progress of HASA activities through newsletters, journals, on-line interactions and other forms of news press. We also collect the significant updates of HR industry to present our members what's happening to global human resources management. Our information comes from world-class publications and professional journals. In addition,HASA works closely with government to deliver to our members the latest versions of laws, rules, regulations and policies for employment practices and help HASA members understand the legal practices to better exercise their responsibilities in full compliance with laws. HASA outlook is the showcase that represents our members' viewpoints of HR management. The majority of HASA members are HR incumbents working at various sizes of companies with diversities of industries and locations of the world. Besides HR practitioners, our key members also comprise of scholars like professors and other experts who conduct researches in HR field. In HASA Outlook, we insist on first-hand articles with original authorship.We encourage our members to share their thougts and insights about HR management through HASA Outlook. 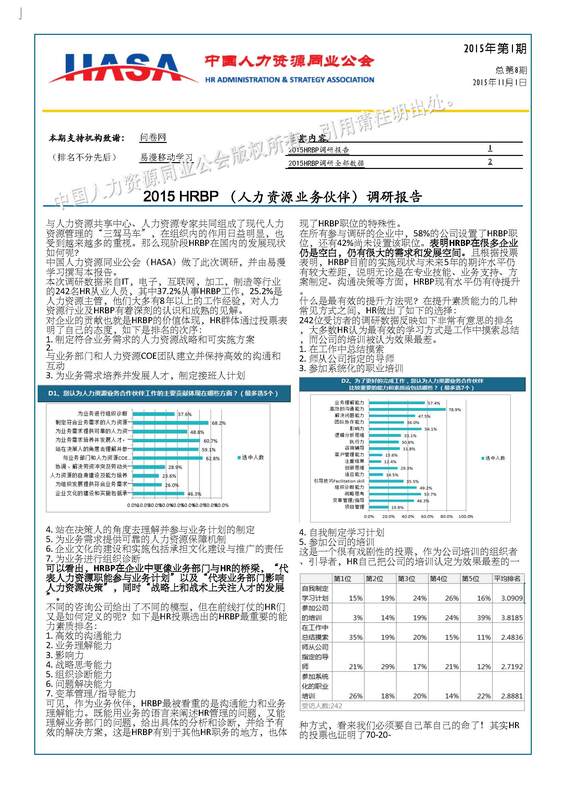 HASA releases its bilingual journal and newsletters in both Chinese & English versions. The publications combine the latest HR practices, theories and case studies from Chinese and global marketplaces, and circulate HR experiences, mindsets and insights of Chinese HR management to the world, as well as import the latest tendency of global HR management for Chinese HR professionals. HASA advocates spirit of knowledge-sharing. We trust our members' professionalism and expertise and expect them be both the beneficiaries and contributors in HR community. As a member of HASA, you are supposed to act the roles of the reader and the author of our publication. Since 2012, HASA selected seasoned HR professionals from our Committee of Expertise to constitute the editorial panel, which is responsible for reviewing of articles contributed to assure the quality of our publication. HASA also has been in official cooperation with significant time-renowned academic journals since its founding. We frequently synchronize outstanding articles from our members to publish on world-class journals. Advertisement: HASA provides advertisements and promotions at publication covers and article pages. HASA launches various kinds of events for professionals to share and exchange their thoughts and experiences about HR management. We also invite entrepreneurs and government officials to join our events in order to offer HR practitioners with a strategic angle to observe and understand how HR function plays a critical role in organziations, and the significance of human resources management in a macro social environment. HASA arranges workshops for particular cases and issues. Experienced HR experts conduct extensive researches and analysis into the concrete matter, and refine new mindset in HR operation, theories and methodologies to offer members a panarama of strategic view of HR management and help members improve their skills of HR management. HASA events are not limited to theory sharing. In the meantime, we also organzie on-site visits. We endeavor to create opportunity for our members to contact the management team and HR staff in outstanding benchmark organizations. We believe those activities enable our members to perceive HR practice in excellent organizations. In addition to professional interactions, HASA organizes events aiming at building mutual understanding and trust amongst our members. HASA wishes counterparts of the HR industry to co-work with us on event matters as Event Partners . HASA offers promotional opportunities for event partners to advertise at HASA events. According to different events, we set various kinds of cooperation plans for our partners. In addition to that, we also provide the following categories of sponsorship for professional activities: Please contact us to know more about how you work with us. For application for event accreditation, please do send us detailed agenda of the activity, including theme, date, moderator and speakers, industries and levels of the targeted audience, and admission fee (or free) and etc.